I will use the word ‘relaxing’ with caution in future. As I write, I am still floating back to earth following a short trip to Austria and Forsthofgut (pronounced Faws-toff-good) hotel. An hour’s drive from Salzburg airport, at the base of the Leogang mountain range – I kept calling it ‘Legoland’, to the amusement of the hotel staff – it is the source of the single most relaxing break I have ever experienced. And I thought I’d made relaxing an art form. There is a surreal quality about this hotel. Picture this: Entering the spa, on the third floor, you walk down steps into a pool. 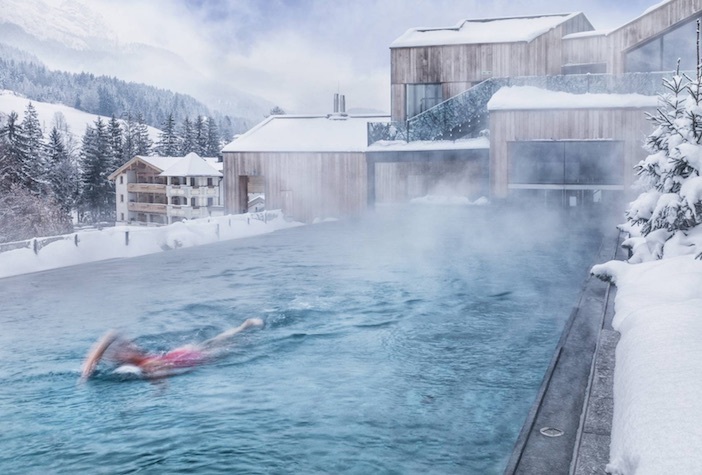 You pull a cord and underwater glass doors silently part and you swim out into an oversized infinity pool to the side of the mountain as skiers and snowboarders swoosh silently past you (or fall over). As steam wafts from the surface of the pool, you look out to the mountain range, like one massive mesmerising screensaver. Another example: There’s a meditation room on the second floor; no phones, no children, no chatter, only a view onto those snow-peaked mountains. There’s a silence so intense you can hear your own heartbeat. I tried the workouts. They had a class called ‘fascinating muscle training’. It involved running your thighs over rollers and balls. An instructor called Saldam, the spitting image of Mr Incredible, puts you through the wringer – literally – until you come out the other end feeling like Elastagirl. The fitness studio also has a huge window on the ski slopes and as I practice yoga in another class, more snowboarders and skiers glide past. The experience is surreal, verging on the ethereal. As ski resorts have taken to boosting their summer season with mountain biking, hiking and rock climbing, they have also developed the mindfulness and wellness element of their business. Some have done it better than others, and this hotel takes the lead. 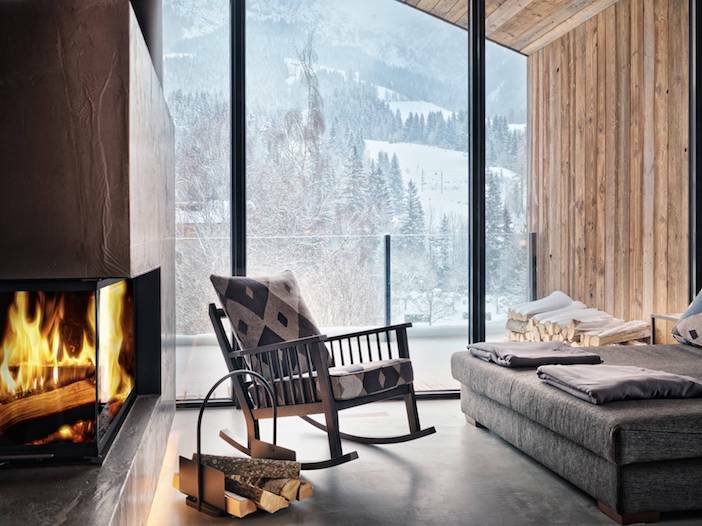 Based in the mountains, where the air is clean and clear, surrounded by the achingly beautiful landscapes of Austrian mountain ranges, the Forsthofgut makes you feel like a five star guest. This is quite rare. Many luxury hotels, however unintentionally, make you feel lucky to be there (or is that just me? ); this one makes you feel you belong. This is a skill, which is not just the result of one element but many. There is the design of the hotel, where every opportunity affords a view through floor-to-sky windows, is carefully considered – there are no hard edges; everything, even the corridors, are curved. The layout of the restaurants is set out in smaller dining rooms so you always feel you are dining in a space altogether more intimate. You also always have your own table and waiting staff. There are three main restaurants, which serve more traditional fayre, fine dining and the main one where breakfast, lunch and a variety of menus are offered for supper. The food is all sourced locally, much of it on the resort’s own farm, and on my visit (just before Easter), there were bunnies absolutely everywhere (wooden ones inside, real ones outside). There was even rabbit on the menu, although having seen the real thing hopping gleefully outside, I didn’t have the heart. You have a choice of Alpin (mountain inspired cuisine), R50 (locally-sourced seasonal produce from no further than a 50km radius) and vegan. Each plate is an Instagram hit. The cheese board is a cheese table. They have over twenty different types of oil, and vinaigrette. There is a butcher offering all types of dried and cured meats and salami. 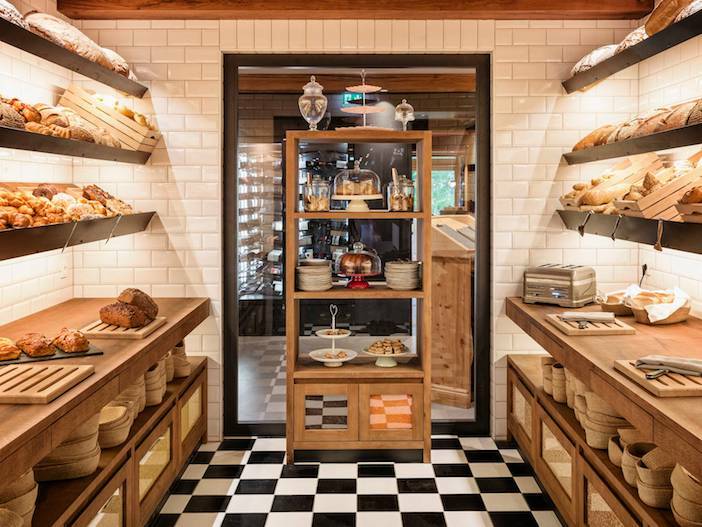 There is a coffee bar, and bakery offering every conceivable variation of bread, cake, and gluten-free carb. And there are little quirks. Guests have to cut their own cress, and for those who are into smashed avocado for breakfast, the chef produces a massive bowl of the stuff. I am reliably informed it always empties by 11. They have an extensive wine cellar, with wine and sherry tastings, as well as fondue evenings in the traditional restaurant. The hotel is popular with families but, here, even children have their own spa, so they are always kept separate from those who want an adult-only experience. The families’ spa, set on the lower level, is like a wonderland, where paths of carefully positioned pebbles lead you through corridors of carpet designed to look like a forest floor, through the indoor and outdoor pools, and around trees which seem to branch out into the ceiling above. And the hotel farm has donkeys and ponies, chickens and even a family of deer, as well as the rabbits. 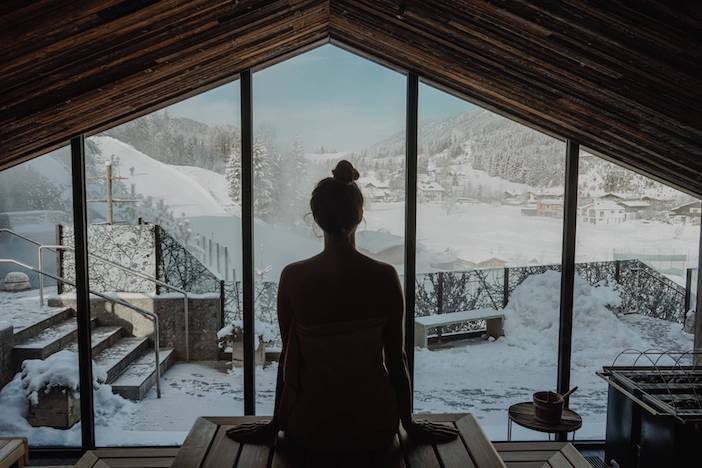 The adult spa is all aromatherapy oils, carefully considered meditation rooms, excellent saunas and steam rooms, which pump out different scents each hour (mountain herbs with wood, lemon and jasmine). And, of course, the panoramic views are always just touching distance away. Staff, adorned in a tasteful grey traditional Austrian dress, are psychic in their efficiency, know more about your subconscious desires than you do. Little wonder most of the guests return year on year, and not just because of the amenities. 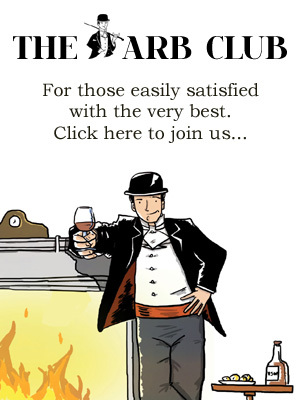 There is an anonymity which each guest experiences at this hotel, and yet you don’t feel invisible. The hotel makes you feel you are invisible to the people you don’t want to see you, and visible to those you do. It’s not simply silence this hotel offers, it’s that ability to disappear. And isn’t that the secret to true relaxation? Rooms from €160 pppn (2 sharing for 4 nights and more, or from €185 for 3 nights and less). Prices include breakfast, dinner and substantial afternoon tea from 2.30 pm. There is also a wide variety of packages available. Spatime at Forsthofgut from €405 for a 2-night break valid from June 23 to December 20 for arrivals on Sunday, Monday or Tuesday. For more information, visit www.forsthofgut.at. For more information about the region, visit www.saalfelden-leogang.com. Sarah Tucker is an author, travel writer and broadcaster – and part-time yoga instructor. To see more of her work, visit www.sarahtucker.info.